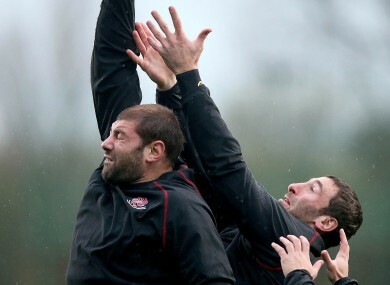 Giorgi Chkhaidze and Alexander Todua compete in the air at training in Donnybrook earlier this week. GEORGIA HEAD COACH Milton Haig has named a team featuring several Top 14 forwards to face Ireland on Sunday afternoon in Dublin. ‘The Lelos’ are without 73-times capped wing Irakli Machkhaneli, who has scored 23 tries at international level, depriving them of their regular captain. Centre David Kacharava, who plays his club rugby in Russia, takes over the leadership. Haig and his assistant coach Michael Bradley have made just three changes to the team that was beaten 23-9 by Tonga in Tbilisi last weekend, with Alexander Todua of Lelo Saracens replacing Machkhaneli on the wing. Giorgi Nemsadze, who plays for Tarbes in the French Pro D2, comes into the second row, while number eight Dimitri Basilaia of Perignan is also included. The biggest names in the Georgian team are Clermont flanker Viktor Kolelishvili, Stade Français tighthead Davit Kubriashvili, loosehead Mikheil Nariashvili of Montpellier and the Toulon second row Kote Mikautadze. You probably can’t go past their pack,” said Ireland coach Joe Schmidt when asked about Georgia’s strengths this afternoon at Carton House. “Kubriashvili was playing in Clermont when I was there, he’s a massive handful. Nariashvili on the loosehead side is, again, very much a threat. I’ve seen a bit of Victor Kolelishvili for Clermont and he is an impressively dynamic ball carrier and a very destructive defender. Replacements: Simon Maisuradze, Zurab Zhvania, Levan Chilachava, Levan Datunashvili, Giorgi Chkhaidze, Vazha Khutsishvili, Lasha Malaguradze, Muraz Giorgadze. Who makes up the Georgian squad taking on Joe Schmidt’s Ireland? Email “Georgia name team featuring several Top 14 forwards to face Ireland”. Feedback on “Georgia name team featuring several Top 14 forwards to face Ireland”.